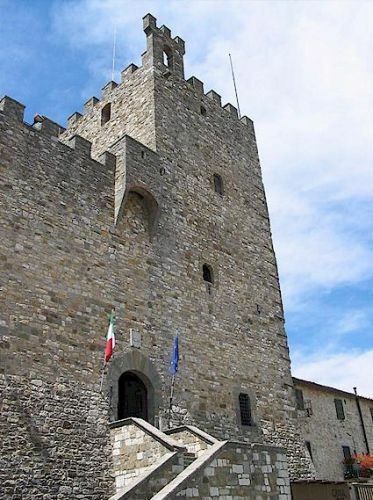 The main features of interest in this 15 C fortress, now the town hall, are the atrium, the council chamber, the Captain’s hall, and the courtyard and well. The entrance hall contains Etruscan finds unearthed in the area. Below the ceiling is a bronze bas-relief paying tribute to the citizens of Castellina killed in the First World War. To the left is the iron coat-of-arms of the Grand Dukes of Habsburg-Lothringen. The top floor windows offer a magnificent view over the town and the surrounding countryside. More about the Romanesque churches of Chianti. This 16 C church, which was rebuilt and extended after the Second World War, is in neo-Romanesque style. It contains an important fresco of the enthroned Madonna attributed to Bicci di Lorenzo (1373-1452), and a wooden Renaissance statue of St. Barnabas, the former patron saint of the town. In the right nave, there is a wooden urn with gold decorations containing the remains of St. Faustus, the present patron saint, donated by the Ugolini family in the 18 C. The left nave contains a 17 C Annunciation of the Tuscan school. To the left of the choir is a 15 C Renaissance ciborium, and behind the altar a 17 C Tuscan crucifix. In the transept stands a modern 40-pipe organ that replaced the ancient one in 1965. The three bells date back to 1797. This is a very impressive arched passage leading along the eastern wall, originally an ancient ‘pomerium’, a public area of archaic origin adjacent to the walls used for sacred and military purposes. Originally open to the sky, it was gradually covered in by private dwellings built right up against the walls when no longer needed as a defence. 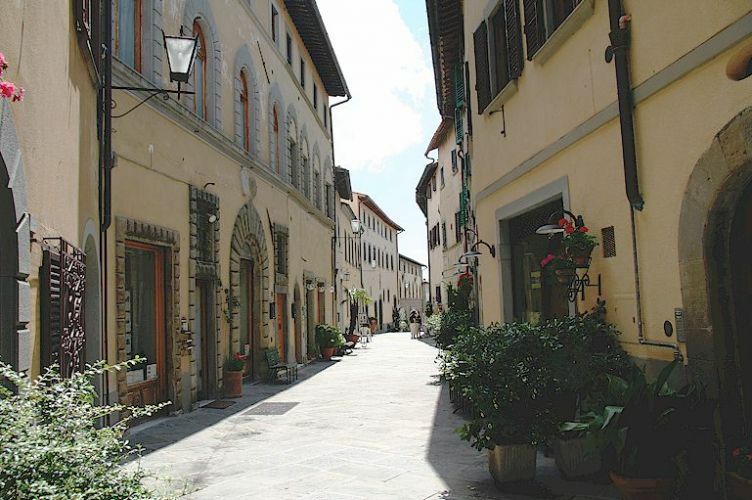 This is the main street of Castellina and home to a number of restaurants, some with outdoor seating. 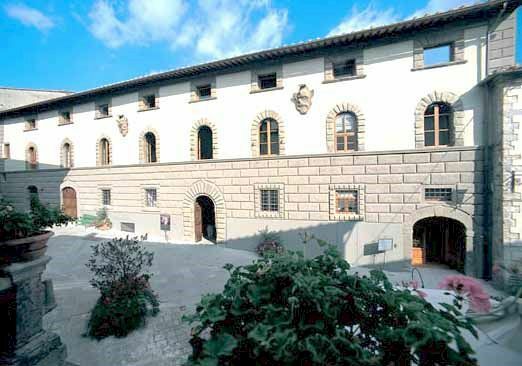 On the right-hand side to the north stands Palazzo Ugolini, formerly Palazzo Squarcialupi, which has a wide façade with three ashlar doors overlaid with grey sandstone, and eight arched windows on the first floor in line with the square windows of the floor above. 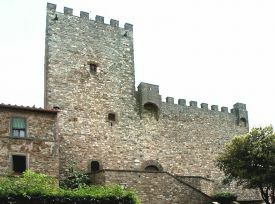 The façade bears two stone coats-of-arms belonging to the Ugolini family. The adjacent Palazzo Biancardi has three storeys and two tiers of windows with sandstone frames. Above the entrance is the Medici coat-of-arms of Pope Leo X (Giovanni de Medici, son of Lorenzo the Magnificent and pope from 1513 to 1521) who stayed here when passing through in 1513. 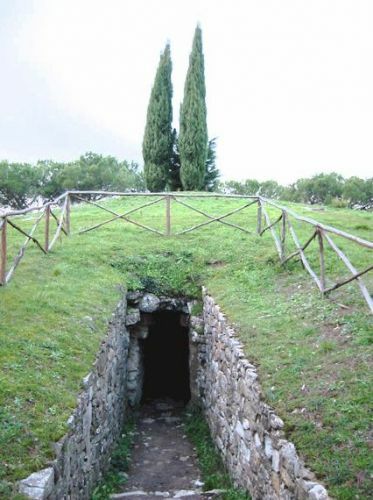 One of the most interesting archaeological discoveries in all of the Chianti was the Etruscan tomb buried under a tumulus on Monte Calvario just outside Castellina. The tomb dates from the sixth century BC and has four burial chambers of the hypogeum type oriented north, south, east, west, and each consisting of a main burial room and lateral cells. The tomb was discovered in the 16 C and excavated in 1915. 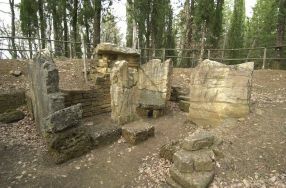 The Etruscan necropolis of Poggino is 2-3 km from Castellina in Chianti on the left side along state highway 222 (the "Chiantigiana") in the direction of Sienna, just before the village of Fonterutoli. 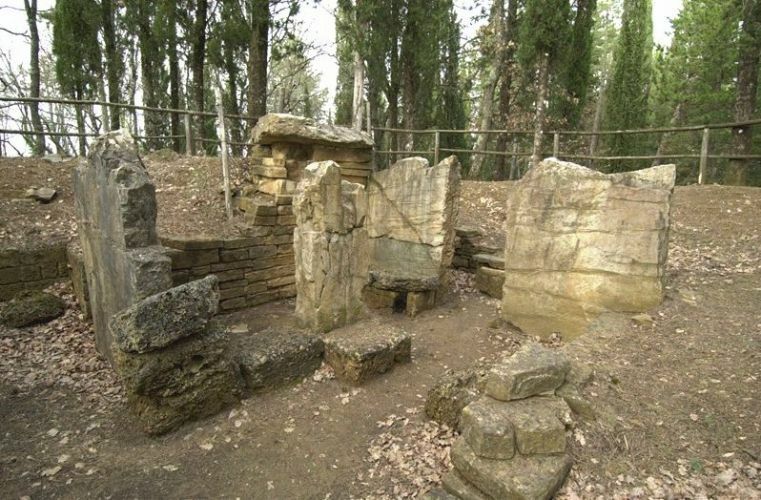 Five Etruscan tombs have been found in the forest, dating back to the sixth century BC. Some of the tomb furnishings are displayed in the lobby of the Rocca of Castellina, including two Attic black-figure amphorae and an Etruscan-Corinthian unguentarium from Vulci. 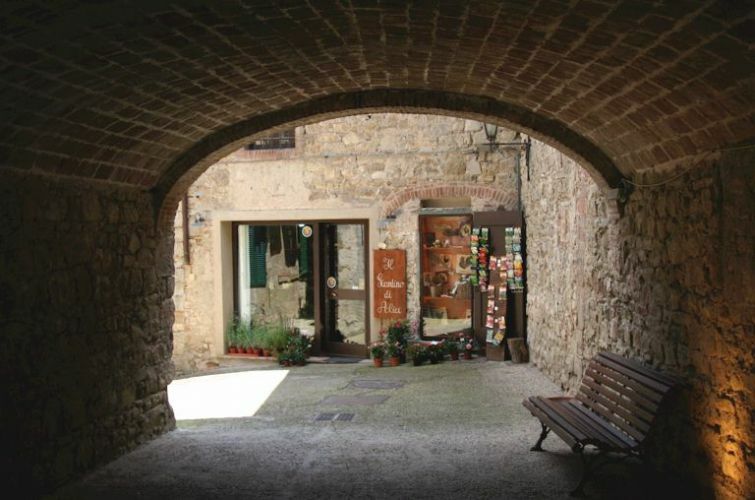 For enthusiasts of things Etruscan, there is an excellent Etruscan Museum in Volterra, and Etruscan tombs may be visited on the outskirts of Cortona - Melone Etruscan tombs and others. 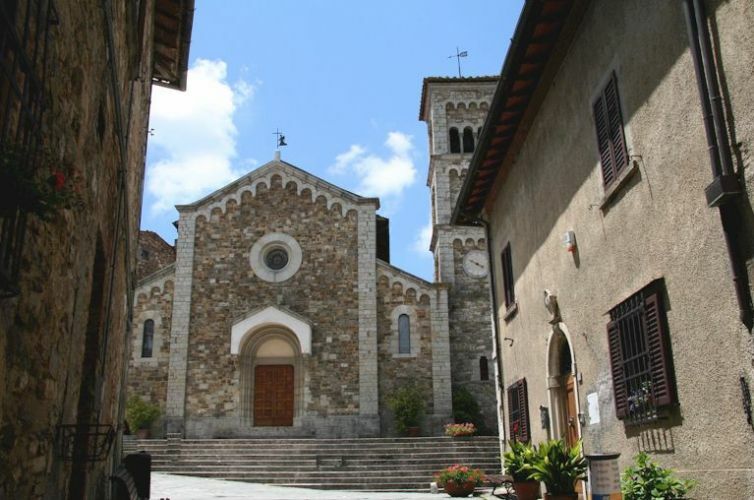 San Leonino in Conio is a very old parish church that once had control of Castellina in Chianti. Now all that remains is the old Romanesque church, with its very interesting interior and beautiful apse. Adjacent to the church are some old buildings that are now used as the priest’s living quarters. 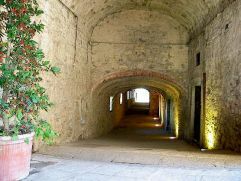 There is also a small cloistered courtyard with an ancient well in the centre. 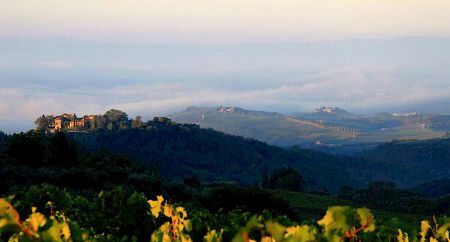 At the southern part of the Castellina territories and at the farthest end of the Chianti region, facing the fortress of Monteriggioni, the ruins of an immense almost completely destroyed castle can be seen. 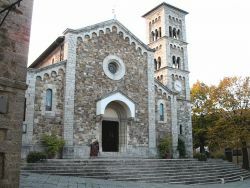 The church of St. Michael (Canonica di San Michele), which has one nave and no apse, is in a good state of preservation. An interesting and unique feature is a decorative motif on the façade, with small arches supported by thin semi-columns with small odd-toed capitals, reminiscence of the nearby Abbey of San Salvatore at Badia a Isola. The decoration line is interrupted in the middle due to past destruction and subsequent restoration. 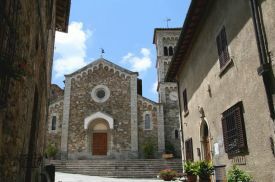 The parish church of Sant’Agnese, on the main road from Castellina in Chianti to Poggibonsi, belongs to the diocese of Siena. The church has three naves and three apses. It was destroyed during the Second World War and has been entirely rebuilt according to the original layout and dimensions. The bell tower is imposing. 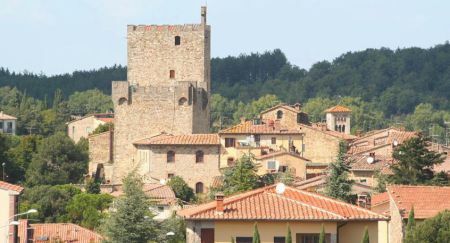 There are other Romanesque churches located in the area, including those of San Cispiano and San Quirico. 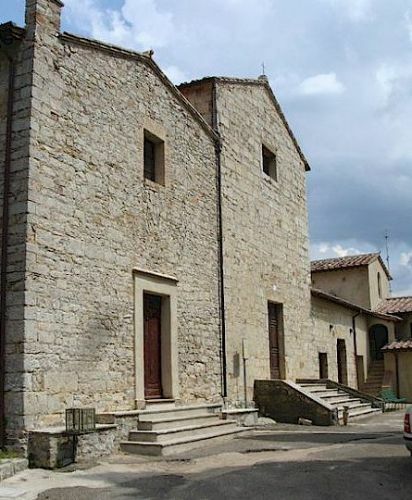 The former, with its single nave and a small apse, is - like Romanesque churches in the Chianti region - built of typical ivory-coloured Albarese stone. The latter has a single nave, and a bell tower added later on one side. No architectural decorations remain. In the region of Cispiano, the imposing ruins of the castle of Monternano, references to which date back to 1089 and which was destroyed in 1254 by Florentine troops, are almost completely covered with wild vegetation. 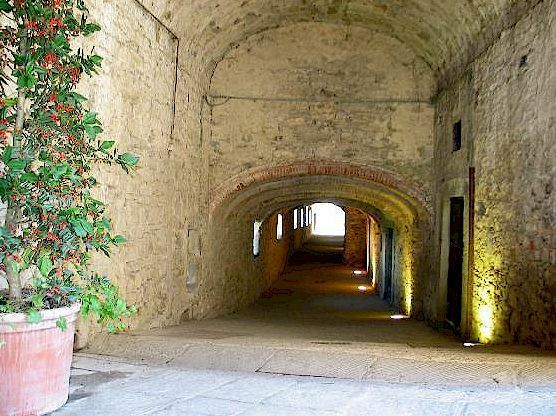 Only doors, arches, walls and underground passages can still be seen. This is very charming spot but rather difficult to locate. Here we provide some links to web pages that give brief but useful information on other sights that can be visted when using Castellina in Chianti as your vacation base. All of the sights in Tuscany are easily reached by car, some in less than an hour, others during the course of a one day excursion. The sights in Umbria are mostly a long one day trip, but still practical if you start off at a reasonably early hour in the morning.